Bengaluru FC made a statement of intent for the coming season by handing contract extensions to Eugeneson Lyngdoh and Joshua Walker among a host of other players who formed the core of the Blues’ successful second season. The announcement was made a day after Bengaluru secured the signatures of North Korean striker Kim Seng-Yong and Seiminlen Doungel. Named the League’s midfielder of the 2014-15 season in which Bengaluru FC finished second, Lyngdoh penned a two-year extension that keeps him with the Blues till the end of the 2016-17 season. Fellow midfielder Joshua Walker too was handed a one-year deal with the club having the option to add another year to it. “I am delighted to extend my stay at Bengaluru FC. I have much left to give the club and its fans and I am grateful that this new deal gives me the chance and the time to be able to do that. I have great teammates, inspiring coaches and amazing fans and cannot wait to make next season bigger,” said Lyngdoh. 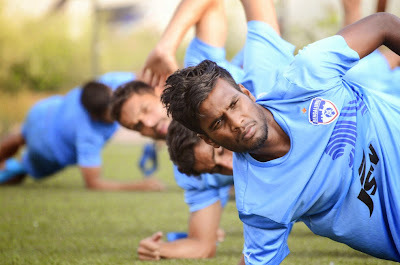 Youngster Shankar Sampingiraj who was one of the League’s revelations this season with consistently mature performances was awarded a new three-year deal. Rino Anto, Lalchhuanmawia, Udanta Singh, Lalthuammawia Ralte, CK Vineeth and Beikhokhei Beingaichho have all been handed two-year deals while Siam Hanghal is on a one year agreement with the club having the choice to extend it at the end of the season. “It was important to retain the core of our team. The boys, owing to the performances they turned up with this season, were the subject of interest from many teams. But we are glad we have been able to retain them and that is a testament of the vision and work ethic of Bengaluru FC. We wish the boys all the best for the coming season and have absolute confidence that they will only get better,” said Mustafa Ghouse, COO, Bengaluru FC.